Wouter Koelewijn has joined Y Soft as Senior Vice President, Managing Director, of Y Soft Scanning Division. The new scanning division within Y Soft indicates the expansion of its core enterprise print management to include advanced scanning and workflow functionality. "Today’s complicated scan menus leave users confused and therefore scanning has not become the productivity enhancer it was meant to be." Y Soft, a leading enterprise office solutions provider, announced today that Wouter Koelewijn has joined Y Soft as Senior Vice President, Managing Director, of Y Soft Scanning Division. The new scanning division within Y Soft indicates the expansion of its core enterprise print management to include advanced scanning and workflow functionality. Prior to working with Y Soft, Mr. Koelewijn founded X-Solutions in late 2002 which was later acquired by Nuance in 2009. 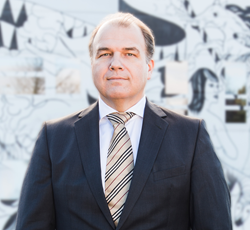 Prior to X-Solutions, Wouter was the CTO and co-founder of a Xerox concessionaire in the Netherlands from 1994-2002. Mr. Koelewijn is married and has two children. He enjoys skiing, swimming and sailing. Y Soft provides enterprise office solutions that help build a smarter business by improving office productivity and enabling employees to be more productive and creative. YSoft SafeQ, our enterprise print management and document capturing solution, reduces costs, improves document security and enhances workflow productivity. YSoft SafeQ’s full suite of modular on-premise or in the cloud solutions are deployed in large companies and SMB organizations around the world. YSoft be3D 3D printers provide a reliable, high quality, auto-calibrating solution that saves time, reduces prototyping costs and enhances 3D printing productivity. Founded in 2000, the company is headquartered in Brno, Czech Republic, with worldwide offices in North and Latin America, Europe, Middle East and Africa (EMEA) and the Asian Pacific Region (APAC). For more information, please visit http://www.ysoft.com.